Global Rail Services are delighted to announce their successful installation of a new Precast Concrete Footbridge at Limerick Junction Station. The footbridge is a staggering 20m long and weighs in at nearly 100 tonnes and was installed utilising 1nr 500 tonne crane and 1nr 300 tonne crane lifting in tandem, in order to install the structure to its final resting place. The works were safely completed on Wednesday Night 10th April 2019, during a mid-week night TIII possession of the railway between 11pm to 5am. 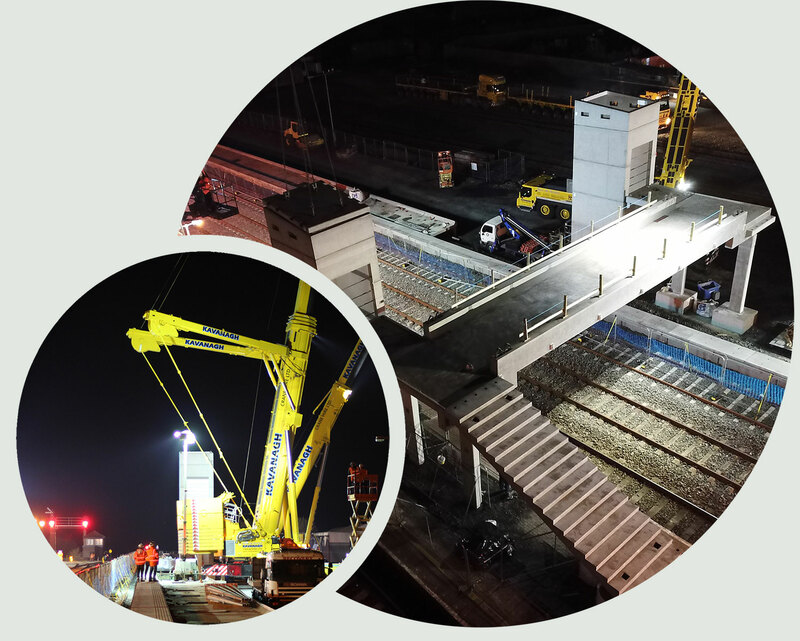 The footbridge installation works were fully managed and co-ordinated by Global Rail Services’ Project and Site Management Team in conjunction with supply chain partners, Shay Murtagh Precast, who supplied the bridge and Kavanagh Crane Hire. Global Rail Services are managing and delivering these works as part of a new €2.5m project at Limerick Junction on behalf of Irish Rail. The complete rail project involves construction of a new 260m precast concrete platform, the production, delivery and installation of the new Precast Concrete footbridge, stairs and lift shafts on piled foundations including all associated structural steelwork and all associated electrical and station/platform infrastructure. The overall objective via the implementation of this scheme is to deliver improved journey times and provide timetable enhancements on the Dublin-Cork and Dublin-Limerick lines, which are currently restricted by a platform conflict at Limerick Junction. Works are being completed both between trains and during railway possessions and are due to continue until June 2019. Congratulations and a very big thanks to all involved for their dedication and many months of hard work, to ensure the safe and successful completion of this very important project milestone.